I once had a sheep-raising pal—one of the Shumway boys—lead me to an active great horned owl pair that was using an old red-tailed hawk's nest in the top of a juniper that had been blown over near Alfalfa. Telling this tale, you have to realize that old pals have different ways of looking at humor, friendship — and science. He wanted to show me the owl's nest to prove they will use a hawk nest, even if the tree has been blown over. The female owl walked all over what was now just a pile of sticks and laid three eggs in them. What my pal didn't warn me about was the behavior of the mom and dad owls. With camera in hand, I climbed through the branches of the old juniper and slowly advanced toward the female sitting low on her nest of sticks. 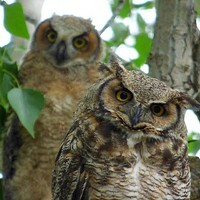 Great horned owls, when distressed, have an astounding vocabulary. They hoot in many ways and tones, bark, clack their upper and lower beak together loudly, and screech very loudly. As I advanced toward the female, she did all of that and more, while never moving from her position on the nest. I failed to look around me (which was almost fatal) when I reached that "not one step further" point. I was suddenly hit alongside the head by the male owl who had been watching me advance toward his mate. The impact was so sudden and violent that I lost my balance and fell over the side of the tree into the limbs. The result was extremely painful and brutal, which at the time I was about 30 years of age and in pretty darn good shape. In spite of my health and vigor, the owl almost tore my ear off on impact. The resulting fall through the stout limbs of the old juniper ripped the clothing from my limbs and torso, leaving large, bleeding holes and gashes. When I hit the ground it was a relief to just stop moving, but I was horrified to hear laughing coming from my pal and the other witness of this debacle, my friend, Ed Park. Both of them — still laughing — came over to help me stand, looking me over. In the meantime, mother owl stopped hooting and father owl went back to his perch in the adjoining juniper to wait for his next curious — but well-meaning — victim. I, in turn, was transported to another fellow birder, Dr. Ettinger in Bend, to have my ear sewed back on and all the bleeding holes plugged. I once watched an adult male great horned owl take a raven right out of the air. The raven was trying to get the owl's mate off her nest so said raven could get the eggs. The raven had actually perched right next to the owl, croaking at her when suddenly I saw the male come swooping in, almost touching the tops of the sagebrush, wings held in the anti-dihedral, doing a good 40 miles per hour. A split second before he made contact with the raven—who had leaped into the air—the owl threw his feet up in front of his face and slammed right into the obnoxious raven. Its partner, who had been expecting owl eggs for lunch, took off without looking back. There's no honor among thieves. I can't impress on you enough the powerful efforts these owls go to in order to protect their children and territory. Unfortunately, or hilariously (depending on your viewpoint of friendship) that particular pair of nesting owls went a long way toward weakening the positive relations the U.S. has with Great Britain. 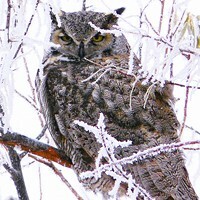 A fellow birder came to Central Oregon from England to add local birds to his "Life List"—one of which was the great horned owl. He kept going on and on about the strength and aggressive attitude of the European eagle owl, I suppose trying to impress us. We sent him up on the top side of that same old fallen juniper to document the new addition to his Life List. He got the same blast alongside the head and almost went down the same hole I made on the side of the tree. His clothing was ripped to shreds, the holes in his body very similar to mine—but his ear was just torn up, not almost off. When the guy, Alan, stopped moaning, we knew he was still alive—but his wife, Sheila, I feared was in the mood to start another revolution when she shouted, "You Yanks are a bunch of bloody savages! That was me old man you almost killed!" I made it up to them when we went to Fort Rock to see the Greater sage-grouse. I had them put up their tent right on the edge of the sage grouse lek, so when they woke up the next morning the grouse—birds they dearly wanted to put on their Life List—were strutting just outside the entrance of their tent. I'll leave this tale by suggesting you forego your television and cell phones tonight and go outside and enjoy the love-making of those beautiful big owls whooo (pun intended) have been — with good reason—nicknamed "The Tiger of the Air."